Nicholas Jarecki’s Arbitrage is at once a beautifully complex, effortlessly compelling legal thriller and a heated, passionate political allegory, working wonderfully on both levels. Nicholas Jarecki’s Arbitrage is at once a beautifully complex, effortlessly compelling legal thriller and a heated, passionate political allegory. It works rather wonderfully on both levels, though Jarecki’s obvious mastery of thriller aesthetics occasionally overshadows his blunt, potent metaphors. Indeed, the director’s mastery of tone, pace, characterization, and atmosphere is simply stunning, so advanced that the viewer is entirely riveted at all times, even when the majority of the action revolves around complex financial processes. If spectacular slow-burn suspense were all the film had to offer, Arbitrage would absolutely be worth a look. But Jarecki only tells this story because he has several very direct messages about the moral decay of the American financial system, and for all the quiet, restrained subtlety of the thriller elements, Jarecki refuses to pull punches when relating the subtext. At its core, Arbitrage is an angry film, bitter and horrified by the legal hypocrisies present in America’s treatment of financial criminals, and Jarecki relates this through grand metaphor and broad ethical indictments of both society and individuals. By the time the blisteringly pessimistic ending rolls around, even the least attentive viewer will have no doubts about the film’s message. The lack of thematic delicacy is not, by and large, a bad thing, though there are moments when Jarecki’s passion for the message overwhelms the film’s more carefully constructed components. Otherwise, Jarecki’s willingness to be frank is invigorating. The film’s utterly contemporary, relentlessly searing nature puts in on par with Oliver Stone’s Wall Street, at least in terms of deftly embodying the economic rage felt by a specific generation. Jarecki implements his allegory through a two-tiered narrative structure. Dark protagonist Robert Miller (Richard Gere) is a billionaire hedge fund manager, and in the initial plot, he struggles to keep his finances in check after a series of bad investments have forced him to sell the company. To do so, he must falsify the books to pass an audit, and much of the film’s tension is wrought from Miller’s attempts to pull off fraud without a hitch. The real-life implications are impossible to miss. Miller’s crimes are similar to those of various investors and financiers who were partially responsible for America’s economic crisis, and Miller is painted as a partially sympathetic representation of these forces. Jarecki could probably explore these issues just fine if Arbitrage restrained itself to simple financial machinations, but the director is, as I said before, more interested in the grand, obvious metaphor. Thus, in the secondary plot, Miller accidentally kills the young woman he is having an affair with in a car crash. It is not an intentional crime, nor one that would do much legal harm to Miller in a vacuum, but because he is a public figure engaged in a highly scrutinized business merge, the scandal would quickly destroy his life and that of his family’s. Miller therefore decides to flee from the scene, embroiling the son of a former friend in the cover-up and risking everything he has ever built in the process. The two plots are elegantly woven together to craft seemingly limitless wells of tension. Though Miller is not a good man, Gere imbues the role with true humanity, allowing us to worry about his fate even while our consciences tell us he deserves to face justice. More interesting is the way the two plots interact to create allegory. In one, we have a financial mogul getting away with real-life crimes, while in the other, he literally evades capture for murder. The insinuation – that America’s refusal to punish white-collar criminals has created an atmosphere where such men can commit capital offenses without retribution – is logically audacious and emotionally honest. When one reads into the culture of unchecked greed, manipulation, and corruption that pervaded Wall Street before and after the crash, it is only natural to become enraged, especially if you or someone close were directly impacted by such dishonest actions. The narrative of Arbitrage is carefully constructed to allegorically portray such sentiment, especially in the final act, and on the whole, Jarecki’s message hits close to home in powerful, immediate ways. That being said, there are moments when Jarecki pushes a bit too far. Tim Roth portrays a detective on Miller’s trail, and while it is an excellent, expertly pulpy performance, the character is underdeveloped and overburdened with thematic exposition. He expresses, at various points, his intense desire to prove Miller killed this girl, not because he has an undying devotion to justice in all its forms, but because he is frustrated by the law’s inability to touch men this powerful. If he can just nail Miller on this one indiscretion, he will have proved a point, to himself as much as society. It is a reasonable motivation for the character, but Jarecki’s script fails to give Roth the necessary background to illustrate why the Detective would act this way. If he had lost his retirement in the crash, or been forced to sell his home after the housing bubble burst, I could understand why Roth is feverishly committed to bringing Miller down. But he has no discernable motivation, and as such, the character often comes across as an unnecessary soundboard for Jarecki’s philosophy. Considering how strongly the allegory comes through on its own, some of Roth’s scenes simply take things a step too far, pulling us out of the carefully crafted tension for obvious moments of thematic reinforcement. For the most part, though, Jarecki manages to combine character, theme, and suspense organically, and the film is by and large a joy to watch. 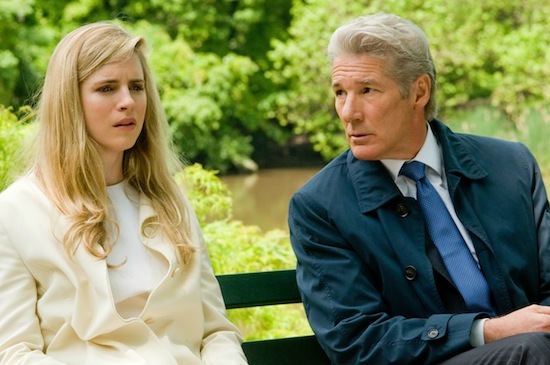 Apart from Gere, who gives one of the single best performances of his career, the entire cast is outstanding, from young, vulnerable Brit Marling as Miller’s daughter to a thoughtfully detached Susan Sarandon as Miller’s wife. As the getaway driver Miller cruelly manipulates, Nate Parker is a true revelation, a sincere human touchstone that grounds the proceedings beautifully. The film features tremendous cinematography, and Cliff Martinez’s intriciate and intense musical score, reminiscent of his outstanding work in Drive, is one of the year’s best. The same can be said of Arbitage as a whole. It is a top-notch thriller, a smart and timely political allegory, and one of the most compelling films of 2012.